Beautiful hand carved study of a hare from lime wood. 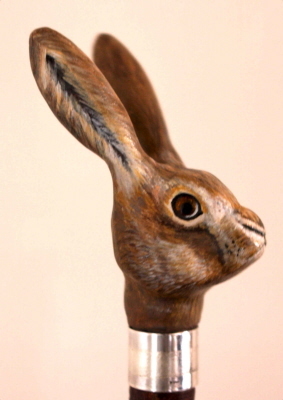 This beautiful hare has glass eyes with hours of hand painting and finally sealed to achieve the fine fur texture. 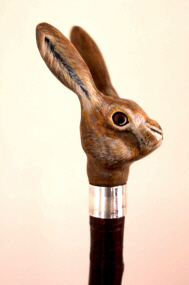 The hare study country walking cane has a choice of collar finishes be it a standard nickel plate or brass collar. Alternatively, for something more special we provide a hand made sterling silver collar with full Assay Hallmarks for London. Alternatively, a hand planished copper and sterling silver collar. 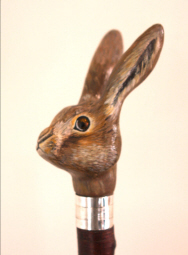 The hare is mounted on a chestnut shaft. 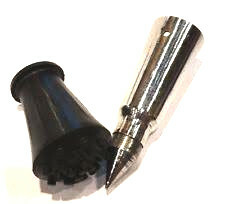 You have a choice of stained chestnut in the colours blue,green or red/amber. 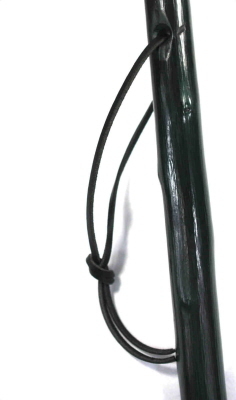 Alternatively, we have some beautiful apple or chestnut shafts that are oiled and ready to go.